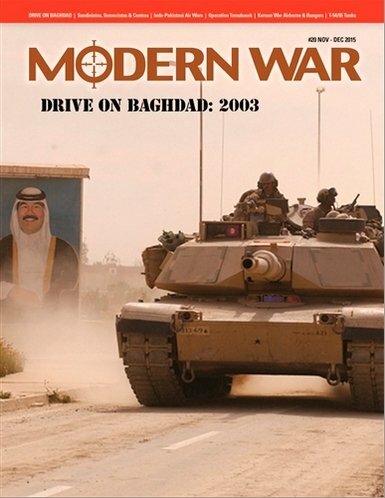 Magazyn Modern War plus gra Race to Baghdad 2003 – operacja Iraqi Freedom, gra jednoosobowa. Modern War, available bi-monthly beginning in September 2012 at bookstores and newsstands nationwide such as Barnes & Noble, will explore the Cold War era, recent conflicts spanning from 1990 to present, as well as potential new wars. Articles will go in-depth to analyze the “how” and “why” of conflicts supported with copious maps, charts and photographs. 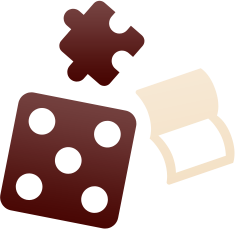 Regular columns will examine weapons, systems and new arenas. 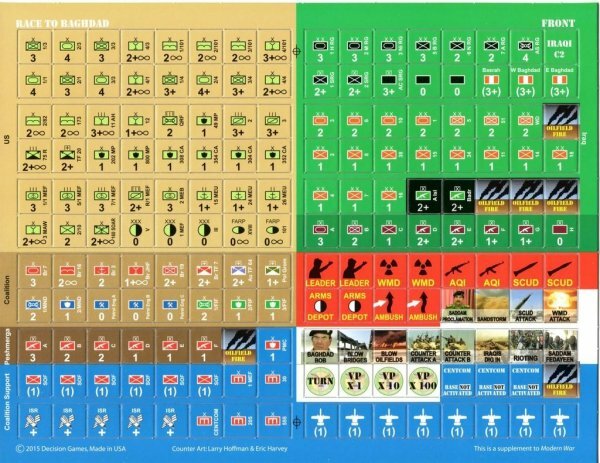 Race to Baghdad: 2003 is a solitaire game in which the player takes command of Central Command Forces during Operation Iraqi Freedom. Your goal is to defeat Saddam Hussein’s forces in such a manner as to prevent a post-campaign insurgency from breaking out. The system plays the Iraqis. 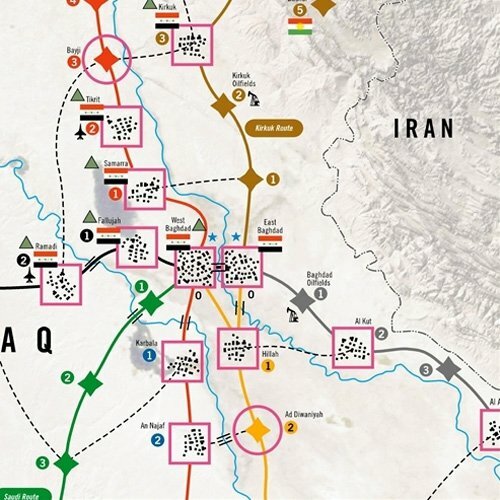 You will have to deal with a variety of situations, such as: battling Republican Guard divisions, safeguarding your lines of supply, sandstorms, etc., all the while keeping up the momentum in your drive on Baghdad. The game has two levels: Standard Rules, which give a quick-play game, and the Optional Rules, which add more realism at the expense of increased complexity. While this is a solitaire game, more than one can play as a team, making decisions by consensus, or with different players managing operations along each vector of Advance.